During my all too brief stint at NYU film school, our professor had us choose from four directors to do an essay on. Kurosawa, Ford, Kubrick and Hitchcock.I choose Hitchcock and I got a B+. Not too shabby for a dumb kid from the Bronx. I will be cliche for a moment and say that they don’t make films like this anymore. Some films remain relevant and thrilling through out the years and Dial M is one of them. 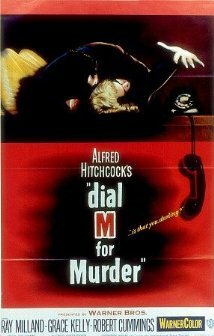 Dial M was released in 1954 and it was, obviously, directed by Alfred Hitchcock. 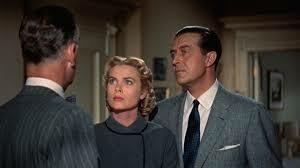 It stars the classy and refined Ray Milland, the beautiful Grace Kelly and Robert Cummings as an American crime fiction author. The setting is England and we are witness to Milland and Kelly as a married couple. But something is askew here. Kelly is cheating on her hubby with Cummings. Milland knows what is going on and with an elaborate scheme in mind plans her demise. He first enlists an old college friend of his and concocts a way to blackmail him into doing the deed. While doing all of this, Milland is smooth, aloof and a bit scary. Kelly does an admirable job at playing the mousy and deceiving wife who has a bit of moral integrity as she does feel guilty about her affair. Without giving away this brilliant plot it is safe to say that Milland’s crazy scheme to off his wife goes completely and utterly wrong. He underestimates his wife and in turn is thrust into a complex web of deception and close calls. This is what Hitch does best. The suspense here is killer as we watch Milland slowly and deliberately try to spin the blame away from him. Milland is amazing to watch. At some point we almost want him to get away with it but Hitch establishes that Milland is smarmy, snakey and charming with absolutely no redeeming qualities to speak off. Kelly and Cummings come to a realization that something is amiss and try to put all the pieces together. Milland, though, for the most part stays cool and collected until the very end when everything unravels accordingly. Most of the on screen action takes place in the large, nicely decorated, living room where Kelly and Milland live. Here in this set up, Hitchcock shines and his camera work is involving and meticulous. As a Scotland Yard inspector comes on board, everyone stays cold and aloof while everything plays out. Only Cummings expresses that overly anxious American fervor as he tries to get to the bottom of the mystery. As pointed out by my pal, Shawn, we audience members make the same mistakes as the perp Milland does. Brilliant observation if I must say. This film is punctual in it’s outcome and very, very smart. Even if you are not a huge fan of Hitchcock, you may still want to see this elaborate thriller and see just how they don’t make them like this anymore. Hitchcockian classics are among the few dated movies I can watch. Ha! Cool. I have a thing for dated movies 😉 I can watch Hitch flicks from any era at any given time and never get tired of ’em. Thanks for checking in and for the feedback, John. Great to hear from you bro!